Peter moved T220796: Chrome 73 introduced higher deviation in metrics from Inbox to Doing on the Performance-Team board. Peter added a comment to T192050: Use Docker version of WebPageTest agents. I continued to test and added the --init to get the rid of the zombie processes. That worked, but after 24 h (or so) Firefox started to fail again. I have reverted back to the old agent and hope to get some attention upstream. Peter updated the task description for T192050: Use Docker version of WebPageTest agents. 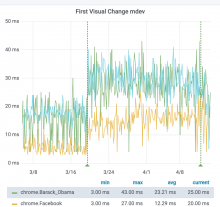 Peter added a comment to T220796: Chrome 73 introduced higher deviation in metrics. 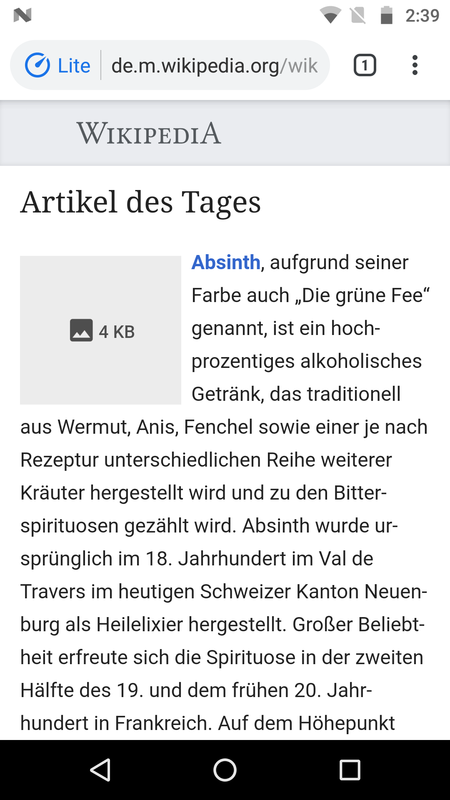 Also enabled 74 for enwiki. I think it looks better on variation but maybe some URLs are slower. Need to run it through the weekend and see what it looks like. No change for Firefox at the same moment, that indicates that there's no change in the Browsertime side, rather a Chrome problem. I'll try out a beta of 74 and see if something changes. Peter created T220796: Chrome 73 introduced higher deviation in metrics. Krinkle awarded Blog Post: Evaluating Element Timing for Images a Love token. Peter published Blog Post: Evaluating Element Timing for Images. Peter added a project to T192050: Use Docker version of WebPageTest agents: Upstream. Peter closed T217533: Create runbook for WebPageTest as Resolved. Updated how to create a new container and how to deploy it. I enabled the alerts on AWS, everything looks good so far except that the used disk space increased by 6% since yesterday, that needs to be fixed. Peter added a comment to T216598: Element Timing for Images origin trial. Let do the blog post tomorrow. Peter added a comment to T220109: Add probe/report for Long Task information. Hmm I think the ScriptDuration is reported in seconds? Yes that much be it. I finally got a version up and running on AWS. I've updated the documentation and need to add Docker agent section I will finish that today, and then I think we should make the switch on Monday (then I can also mention it at todays SoS so reading knows before IF there will be any changes to metrics. Peter moved T192050: Use Docker version of WebPageTest agents from Backlog: Future Goals to Doing on the Performance-Team board. Peter closed T216571: Write runbook about releasing/deploying Fresnel as Resolved. This worked fine yesterday so let us close it! Peter moved T195233: Blog post: Explain how we use Browsertime/WebPageReplay/WebPageTest from Backlog: Small & Maintenance to Doing on the Performance-Team board. Peter renamed T195233: Blog post: Explain how we use Browsertime/WebPageReplay/WebPageTest from Blog post: Explain how we use Browsertime/WebPageReplay to Blog post: Explain how we use Browsertime/WebPageReplay/WebPageTest. Peter moved T213398: Move performance team dashboards to /performance/ folder in Grafana from Doing to Backlog: Small & Maintenance on the Performance-Team board. Peter reassigned T213398: Move performance team dashboards to /performance/ folder in Grafana from Peter to Krinkle. I've moved the dashboards for WebPageTest and WebPageReplay to performance. Signing over you @Krinkle and you can choose how wanna do with the ones for Navtiming. Peter closed T185446: Create static version of wiki page as reference page for our tests as Resolved. Peter added a comment to T185446: Create static version of wiki page as reference page for our tests. Peter changed the status of T217771: Remove (or fix) noisy Speed Index alerts from Open to Stalled. This is waiting on getting banners on the WebPageReplay tests so I can add the correct alert + verify that it works. Peter closed T218786: Upgrade (and do annotation) for Chrome 73 and Firefox 66 in our testing as Resolved. 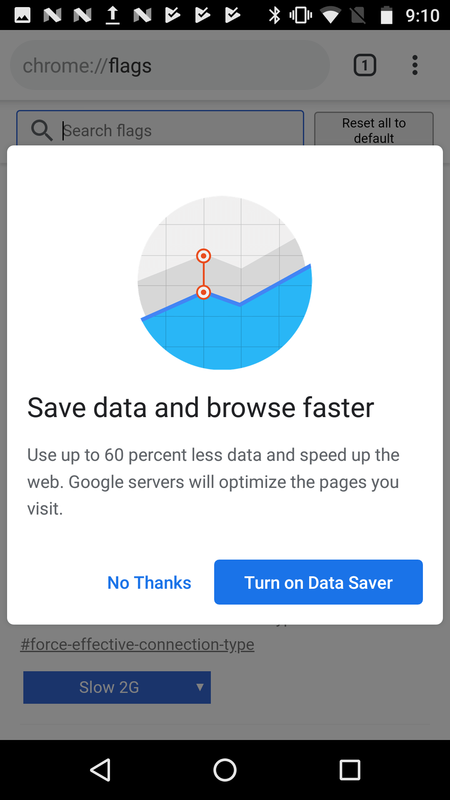 For Chrome we could see different behavior but nothing concistent. I've added annotations on all places so if we see something in RUM we can go back to the synthetic. Peter closed T218071: Update the WebPageTest wrapper to use the latest dependencies as Resolved. This was done last week. Peter closed T219231: Collect element timings for RU wiki as Resolved. Peter created T219496: [Meta] Next level of synthetic testing. Peter created T219495: Automate finding forced layouts. Peter closed T219220: Remove visual elements hack on the WebPageTest server as Resolved. Peter moved T210046: Integrate https://chromedevtools.github.io/timeline-viewer/ to our trace logs from Doing to Backlog: Small & Maintenance on the Performance-Team board. Peter moved T214026: Create a list of what's needed for getting the mobile phone performance lab running from Doing to Backlog: Small & Maintenance on the Performance-Team board. Peter moved T215489: [Investigate] Measure time spent as a logged in user from different locations from Doing to Backlog: Small & Maintenance on the Performance-Team board. Peter moved T219231: Collect element timings for RU wiki from Inbox to Backlog: Small & Maintenance on the Performance-Team board. Peter moved T219220: Remove visual elements hack on the WebPageTest server from Inbox to Backlog: Small & Maintenance on the Performance-Team board. Peter moved T218786: Upgrade (and do annotation) for Chrome 73 and Firefox 66 in our testing from Inbox to Doing on the Performance-Team board. Peter claimed T219220: Remove visual elements hack on the WebPageTest server. Peter created T219231: Collect element timings for RU wiki. Peter created T219220: Remove visual elements hack on the WebPageTest server. Peter added a comment to T218786: Upgrade (and do annotation) for Chrome 73 and Firefox 66 in our testing. The current run on WebPageTest got Firefox 66 so I marked an annotation. However we don't graph navigation timing data (or collect it by default) so I think we need to compare individually runs. 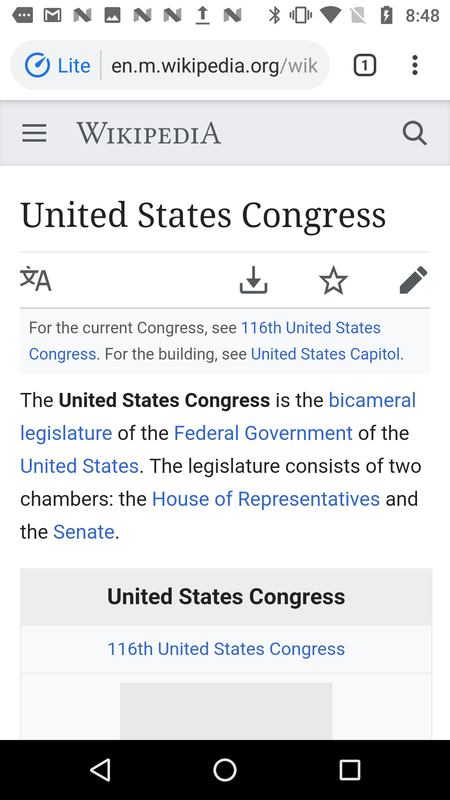 Peter added a comment to T218618: Consider disabling Chrome Lite pages for Wikipedia on Chrome on mobile with Cache-Control: no-transform. 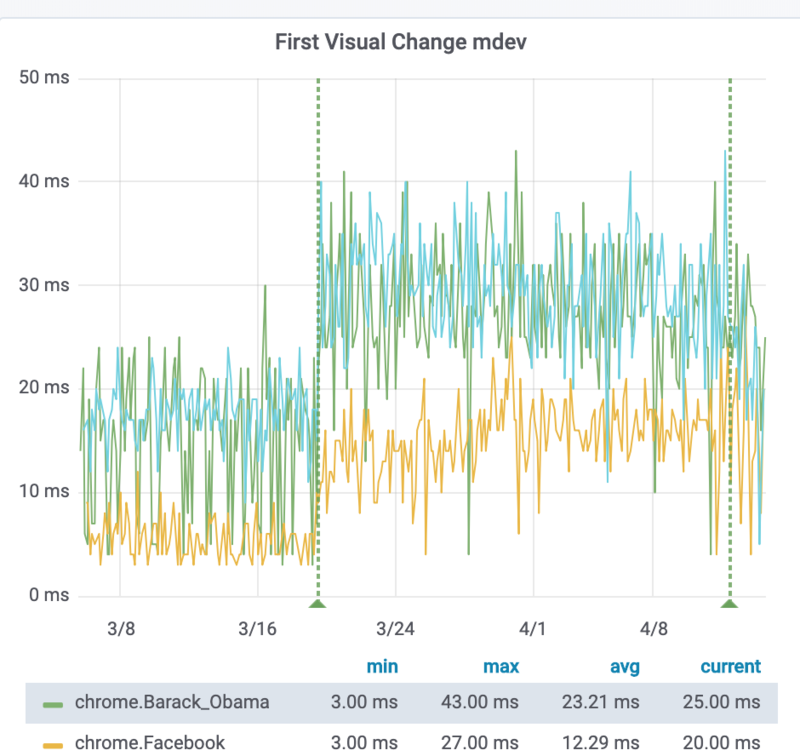 @dr0ptp4kt in https://blog.chromium.org/2019/03/chrome-lite-pages-for-faster-leaner.html is says it supports the https://developers.google.com/web/updates/2018/09/reportingapi (adding a URL as a report header) but I haven't looked into it. Adding example HARs for 66 and 65. Peter created T218786: Upgrade (and do annotation) for Chrome 73 and Firefox 66 in our testing. Peter added a comment to T217771: Remove (or fix) noisy Speed Index alerts. I've pushed a fix to fetch the User Timings, let it run for a an hour or two and I can start to add it to the test for group 1 that runs banners at the moment. Peter triaged T217771: Remove (or fix) noisy Speed Index alerts as Normal priority. I've added it for WebPageTest yesterday and will add it for WebPageReplay the next time we got banners (it will make it easier since we auto-magical pick up the User Timings). Peter closed T218202: Investigate how Chrome Lite Pages affects us as Resolved. Closing since the privacy issues in T218618 is the most important ones. Also adding https://gist.github.com/soulgalore/430cee73ca2311e815b0fa824b5e0d2a that is a potential (but not working) way to automate to test Lite pages. Peter added a comment to T218202: Investigate how Chrome Lite Pages affects us. Created T218618 about the privacy issue. Peter created T218618: Consider disabling Chrome Lite pages for Wikipedia on Chrome on mobile with Cache-Control: no-transform. Btw this reminds me of the problem we used to have with the Opera in proxy mode. Yes you are right @Krinkle they are not there. I haven't got around to hook up the phone to my computer yet, let me try that to see if I can see more what's actually is happening. Peter updated subscribers of T218202: Investigate how Chrome Lite Pages affects us. Adding @Jdlrobson since I think you will be interested in this. Had a quick try on 73 beta (73 hasn't reached the play store yet for me). Enable data saver and setting 2g as network let me get the light version of Wikipedia (or one version, I guess it can be multiple versions). Most images are blocked (not all but all major images). Clicking on the them open the media viewer but you cannot see the image. It is also blocked in the Commons File page. Peter created T218202: Investigate how Chrome Lite Pages affects us. Peter updated subscribers of T217771: Remove (or fix) noisy Speed Index alerts. I think the best way to know this is to use the User Timing mwCentralNoticeBanner that will always be there when we show it right @Gilles? Peter moved T217732: Add documentation for setting up a new agent from Inbox to Backlog: Small & Maintenance on the Performance-Team board. Peter moved T217771: Remove (or fix) noisy Speed Index alerts from Inbox to Backlog: Small & Maintenance on the Performance-Team board. Peter moved T218071: Update the WebPageTest wrapper to use the latest dependencies from Inbox to Doing on the Performance-Team board. Peter created T218071: Update the WebPageTest wrapper to use the latest dependencies. Tgr awarded T133646: Run performance test on commits (Fresnel) a Love token. Peter closed T217729: Try out gnirehtet for reverse tethering as Resolved. Tried and it was at least so stable so we can measure difference between a logged in user vs a user with a cold cache. I could confirm on a real phone that on a slow connection up:768 down:1600 rtt:150 the first paint happens faster for a logged in user than for a user with a cold cache. Peter closed T217729: Try out gnirehtet for reverse tethering, a subtask of T197847: Collect performance metrics from a mobile over time, as Resolved. Peter added a comment to T217729: Try out gnirehtet for reverse tethering. I tried this today from my Mac. The rust version didn't work for me (I got https://github.com/Genymobile/gnirehtet/issues/136). Switching to the Java version worked fine. Peter created T217771: Remove (or fix) noisy Speed Index alerts. Peter created T217732: Add documentation for setting up a new agent. Peter created T217729: Try out gnirehtet for reverse tethering. Peter closed T217659: Create tagged WPTAgent container as Resolved. Peter closed T217659: Create tagged WPTAgent container, a subtask of T192050: Use Docker version of WebPageTest agents, as Resolved. Peter added a comment to T217659: Create tagged WPTAgent container. Peter changed the status of T192050: Use Docker version of WebPageTest agents from Stalled to Open. Peter created T217659: Create tagged WPTAgent container. Since there are no changelong and really rare releases, I think the tag needs to include the build date + Chrome and Firefox version (and then we can add Edge (or what it will be called) version when it's available on Linux. Peter moved T192050: Use Docker version of WebPageTest agents from Blocked to Backlog: Future Goals on the Performance-Team board. I think the way forward is to tag our own containers. Let me fix that. Peter created T217536: Separate cold cache hits vs somehow warm cache hits in Navigation Timing metrics. Peter created T217534: Create runbook for WebPageReplay. Peter created T217533: Create runbook for WebPageTest. Peter created T217532: Collect Navigation Timing metrics from focus areas. Peter added a comment to T217138: Add synthetic tests for ruwiki. Peter added a comment to Blog Post: Choosing tools for continuous integration. Peter added a comment to T216499: Priority Hints origin trial. So then if I wanna try it out, it should just work if I compare 72 with 73 right? WebPageTest will just roll forward with 73 when it's available but we could run it manually with the current beta installed on the WPT server, just to get the different HAR files, that would be interesting. Peter added a comment to T215489: [Investigate] Measure time spent as a logged in user from different locations. To be clear, do you follow/render the redirect or just toss the response once you see the cookie headers? If it's the former, is the browser cache cleared after the main page or is it also not cleared? I've started documenting at https://wikitech.wikimedia.org/wiki/Performance/Synthetic_Measurement_Experiment_2019 - I'll make sure I'll copy the full scripts by the end of the day and them too and then shutdown the instances and start to add graphs and summary when I'm back at work next Friday.